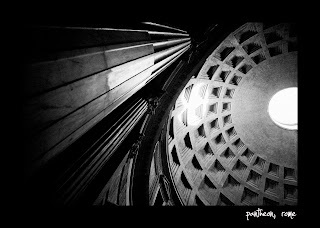 Dianne and I visited the Pantheon twice during a recent visit to Rome. It is one of my favourite places in the city. 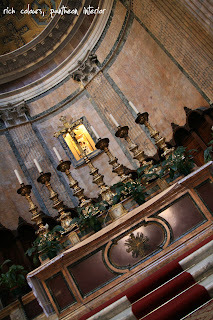 When I lived in Rome I would visit almost every day. It's such a beautiful building, and even when it's full of tourists its elegance and splendour can still be appreciated. 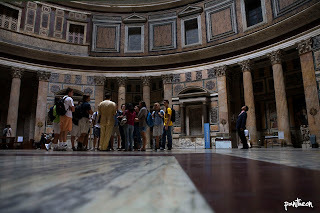 Capturing the essence of the Pantheon is difficult, as it is such an expansive interior. 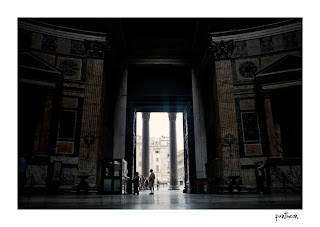 For me (remember photography is personal) the key elements to capture are the marble columns, the oculus, the richness of the colours, and the tourists. 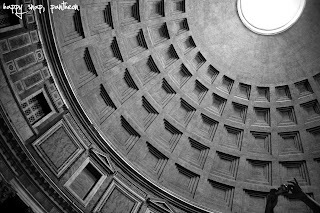 The image above is obviously of the columns and oculus. It was taken down low and I shot wide, leaning off one of the columns which I also used for support. I was able to include two strong elements to identify the Pantheon in a single shot. Here is another, this time including the beautiful and distinctive marble foors. I also included the tourists. I shot low and wide off the floor (when doing this you really have to have an interesting foreground subject as it is going to be a sizeable part of your image - in this instance it is the marble floor and the directional lines) - and I waited for a tourist to do something interesting. Dianne took this shot below, and I love it. Dianne was obviously wanting to capture the detail in the ceiling and oculus, and then a fellow shooter popped their camera up into the shot uninentionally of course. A lovely example of a random action creating an unexpectedly delightful photographic moment. 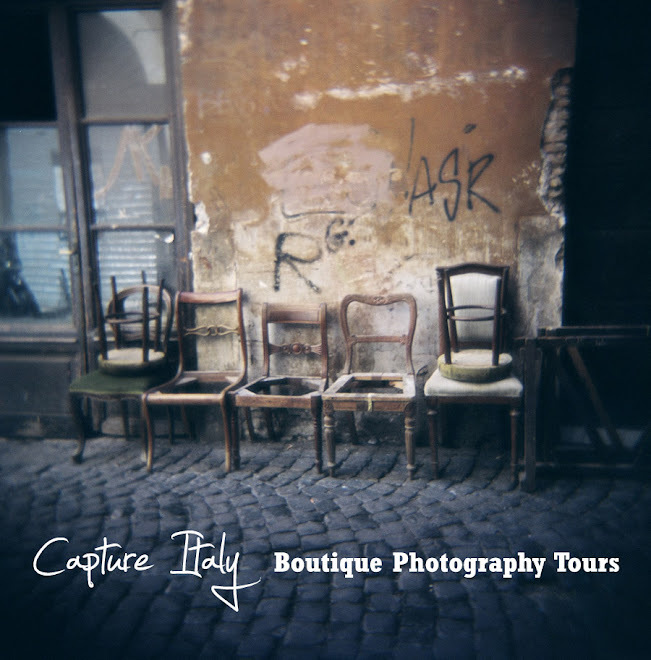 A personal theme I enjoy exploring in my photography is capturing the less "exciting" aspects of these amazing beautiful historical buildings in Italy. 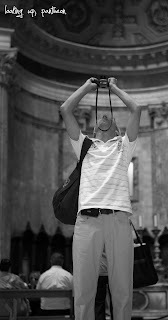 Below is an image of one of the cleaners of the Pantheon. 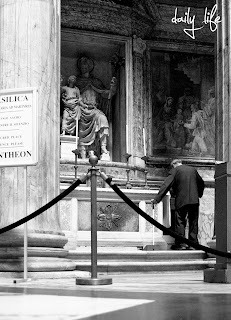 Whilst tourists are gawking in amazement at the sheer beauty of the Pantheon, this gentleman goes about quietly cleaning. Remember that telling the story of a monument can be broader than just getting the classic shots.